Space Hulk: Death Angel is a 1-6 player card game as brutal as its predecessor. It has a ton of expansions, and it quickly outgrew its box. I love to play this as a time killer while waiting for family or board game night to start. It is brutal enough that it could be over in 5 minutes, but it is complex enough to withstand repeated plays. I wanted a replacement box to be sturdy enough for for transport with the modern features of board game boxes that made parts easy to find and keep organized. I decided to go with a black Sancho Panza box. After the labels were removed with acetone, I removed the inner lining and deororized the whole box with Odor-xit, an amazing oxidizer. I lightly sanded the inside and blew it out, just in case. Modern enhancements were card sleeves and push.pop style card storage. Card sleeves let me play almost anywhere. The Fantasy Flight sleeves were well matched for size. The push/pop method of card storage was introduced to me with Lords of Waterdeep. The insert in that game allows you the push down on one side of a deck of cards and pop up the whole deck at once. No more groping in the bottom of the well for that one last card. Once I had my features, I sketched out a plan. 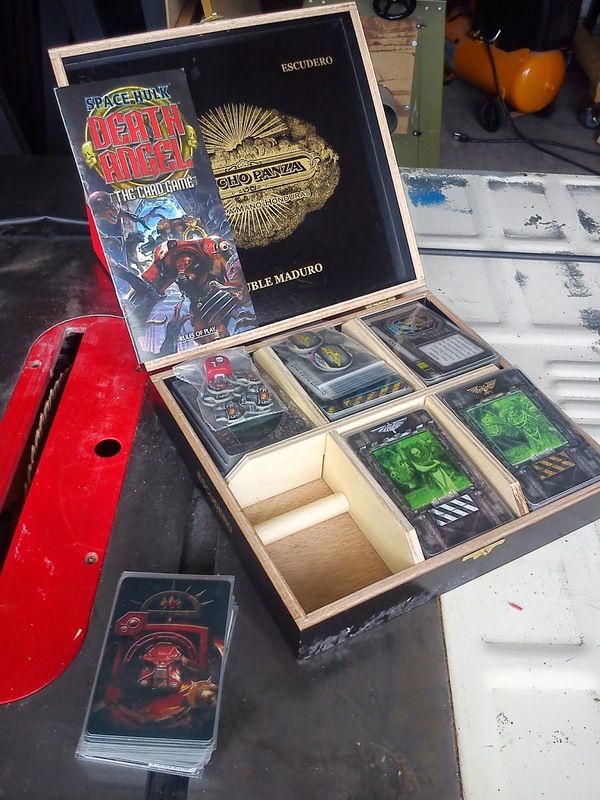 I calculated the height of the interior of the cigar box, and I left a little room for a rule book to sit on top. The cards would be separated into six piles. With the different expansions, this worked out pretty well. Sleeved, only one pile gives me trouble and slips out regularly. Each partition was made from 1/4" baltic birch cabinet plywood I had a sheet of. This stuff is great for ripping into strips. I used it on the Dominion Case as well. I then notched the corners to make sure they fit in the box easier. The final step was to cut slots into the horizontal divider and a single slot in the vertical dividers. This was mostly done by feel. I cut the outside edges, cleaned up the center and tested the fit. This was repeated until I was satisfied. Overall, the box had dramatically improved the portability of the game with all its expansions. The box complements the game itself in its simplicity and order. I did not leave room for the rule book at first. I had to chop down the height of the dividers once I realized the oversight. 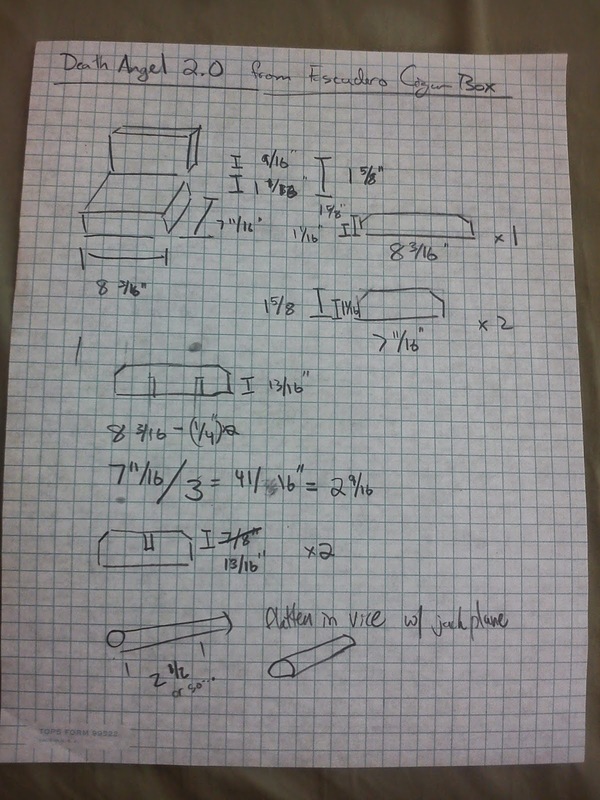 I originally slotted the vertical dividers x 2 on the wrong side of the measurement. This left half of the cards with a much tighter fit. It took me a it to figure out what I'd done, and I was unable to salvage those dividers. When making cuts in "The Middle", ensure you have things in the exact middle by flipping your pieces around once they have been marked. The middle should be in the same place on both pieces. Removing the exterior lining may not have been the best way to do things. The biggest problem with this box is that the cards will slip out through the gap between the lid and the bottom. Moving the push/pop dowels to the outside edge could fix this too. The sleeves would probably need to come off if the second option was used as the interior would lose 1/16" on all sides. Salvaged cigar boxes need better hardware. Especially when transporting them, it is important that all components remain secure. A swing latch could greatly increase the ability to keep the lid closed beyond the simple latches on the cigar boxes. I'm going to pick some up and make some recommendations in a future post.